Hello from the depths of a busy and colorful sewing room! I have been stitching up itty bitty, swoon worthy ornaments that make me squeal every. darn. time. BUT I am taking a break to introduce our newest fundraiser family, the Chasteen Family. Leigh was instrumental in our first adoption and was a huge source of encouragement and information. I am beyond excited their amazing family is heading back to China! It’s with pleasure and honor I team up with them for this MaeBeSew-Chasteen Fundraiser! We are the Chasteen family. We are a family of 6, soon to be 7! Adoption has been close to our hearts for as long as I can remember. We knew early on in our marriage, we wanted to adopt. Our daughter, Zoe, came home from China in 2014. From the early days home with Zoe, adoption continued to be something we thought about. We became a foster family about a year and a half after bringing Zoe home. We have seen a need here, locally, and a need internationally for children who need loving families and support. We began our journey to go back to China in the Spring. We matched with our new daughter, who is six, and only two weeks younger than Zoe, in August. We are anxiously waiting to welcome her home and hope to travel in early 2019! With holidays around the corner and so many cute new items in the shop, it’s certainly an easier time to shop smart! What does “shop smart” mean? During the last few years we finacially managed to pull off two internationally adoptions. It should have been an impossible feat. 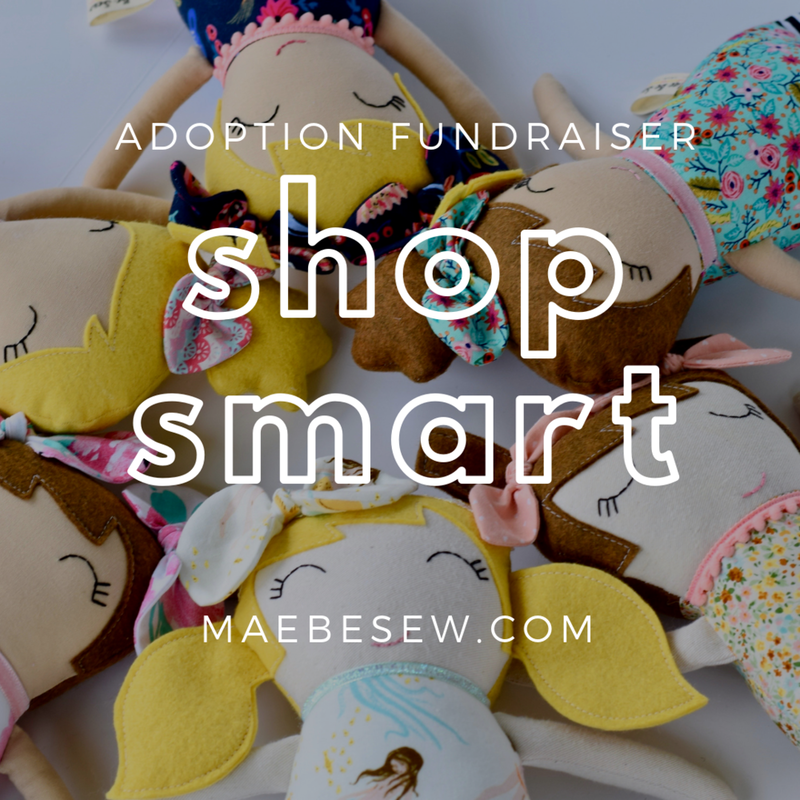 MaeBeSew was born from this challenge and was a sweet and creative way to support our growing family and the costs associated with adoption. We’ve continued MaeBeSew to help support our family of 6 and others adopting. Through these last several years, it has shown me personally how valuable our shopping selection can be both as the receiver (business owner) and giver (shopping smarter). We can buy clothes, gifts, toys, food, and every day items from individuals & companies directly supporting their own families, adoption and other amazing causes that may be close to your heart. Being on a tight budget, the past action has always been to choose the least expensive item, but now, even on a tight budget, we shop with intent. If we have a little or a lot to spend, we want it spent on items that have meaning and impact beyond the initial purchase when possible. Every item purchased at MaeBeSew under “Chasteen Family” from now until October 8th gets them a few steps closer to bringing home their daughter. One of my favorite things about adoption is the village it takes and bonds together. There are so many ways to be part of the village and shopping smart is fun and easy! Let us know how you are shopping smart! We love hearing new ideas and seeing new great companies! Let’s start the weekend off with a bang supporting our newest friends, the Chasteen Family. If you’d like to give directly, you can here.